Saturn and its rings manifest a rich interplay between shadow and light. The rings shine on their unilluminated side by virtue of scattered sunlight emerging from its passage through the ringplane. The dense B ring does not allow much light to pass through, while the C ring is so sheer as to allow the planet to be visible on its other side. On the planet, shadows cast by the rings arc across the northern hemisphere. Saturn's night side is illuminated in the south by light reflected from the rings' sunlit face. 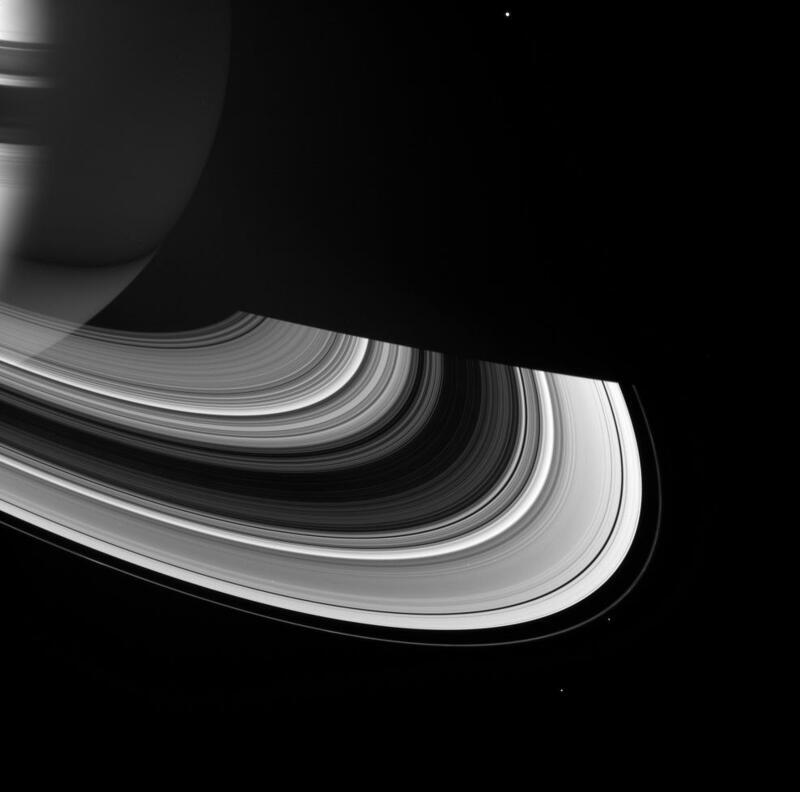 The night-side northern hemisphere is also lit faintly by the face of the rings that is seen in this image. The planet's shadow extends across the ringplane toward right. Several of Saturn's inner moons are visible in this view (from top to bottom): Mimas (397 kilometers, or 247 miles across), Pandora (84 kilometers, or 52 miles across), and Epimetheus (116 kilometers, or 72 miles across). This view looks toward the rings from about 19 degrees above the ringplane. The image was taken in visible green light with the Cassini spacecraft wide-angle camera on April 13, 2007 at a distance of approximately 1.9 million kilometers (1.2 million miles) from Saturn. Image scale is 107 kilometers (67 miles) per pixel.